Today, Vitamin C used in skincare is still proving to be an outstanding performer in providing amazing results for a multitude of skin conditions. Australian skins are constantly punished by the harsh environmental conditions we are exposed to. Our skins are constantly fighting major free radical damage. Sun, undoubtedly the most damaging leaves our skin exposed to premature ageing, pigmentation, and thickened skin. Add to that smoking, poor diet, extreme weather conditions, air conditioning/heating – and you can have a total recipe for disaster for your precious skin. 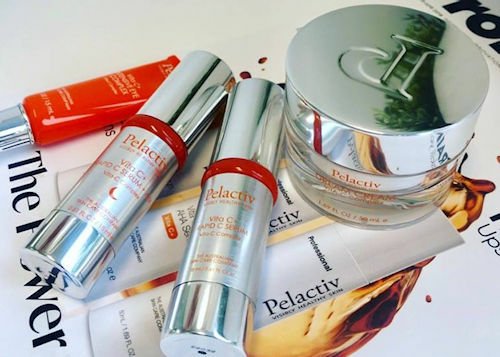 The Pelactiv Vitamin C+ skincare range has followed the tried and tested philosophy of combining science with nature to develop a performance product that rejuvenates, hydrates and heals the skin. By using a combination of L-Ascorbic Acid, Kakadu Plum and Lactic Acid we have created a range of results driven Vitamin C products that provide a visible difference to the skin. This combination of science with nature allows a better absorption into the skin making our delivery system unique. Our system has direct communication with your skin, speaking the skin’s language. Clients wanted the results from this Vita C range without the reactions such as flakiness and redness. Therein lies the launch of the Pelactiv Vita C+ Professional Skincare Range. We wanted a complete system – the perfect range of Vitamin C+ products that deliver a complete facial regime with ongoing results. Environmental Factors Free radicals are found in our skin and when exposed to pollution or other environmental factors like smoke or sunlight they break down our collagen and elastin fibres. Collagen and elastin are essential proteins providing elasticity to the skin helping it to appear more youthful, firmer and healthier. Breakdowns of collagen and elastin cause the skin to age by showing signs of premature ageing such as wrinkles and loss of elasticity. The main performers in this Pelactiv range are: L-Ascorbic Acid, Kakadu Plum and Lactic Acid. Lactic Acid It was an obvious choice for Pelactiv to incorporate the use of Lactic Acid into its Vitamin C range. The benefits only enhance the ongoing use of these products. Lactic Acid is a form of AHA (Alpha Hydroxy Acid) which provides so many functions. Exfoliating, hydrating, lightening, firming, fights the visible signs of premature ageing. Effective, yet not aggressive so can be used by most skin types. L-Ascorbic Acid Pelactiv haven chosen L-Ascorbic Acid as it is the only antioxidant that both neutralises free radicals and dramatically increases synthesis of collagen. L-Ascorbic Acid is the only Vitamin C that can easily penetrate the skins cells. Pelactiv use high concentrations (15%) of Vitamin C in their serums to ensure that it is topically effective. Alongside the active ingredient of L-Ascorbic Acid Pelactiv have added the benefits of our amazing Australian Native Botanicals for obvious reasons. Kakadu Plum The benefits of Kakadu Plum are used to enhance the performance of the Pelactiv Vita C+ skincare range. It is an antioxidant, stimulates collagen production and evens skin tone. Kakadu Plum contains a considerable amount of Vitamin C that plays an essential role in slowing down the ageing process. With Australian Native Plant Extracts. This deliciously refreshing foaming gel cleanser enriched with Vitamin C and Green Tea Extract offers immediate moisture to the skin plus long term hydration as it removes impurities without drying your skin. Specifically formulated to re-hydrate and soften the skin while gently minimising pores. Leaves skin clean, soft and beautifully hydrated. balanced and refreshed. This formula contains Vitamin C and natural plant extracts of green tea and cucumber which help minimise open pores whilst providing improved skin texture and clarity. Beautifully calming and rehydrating. formulated to effectively deliver high concentrations of stable Vitamin C to your skin. Formulated to combat visible signs of premature ageing caused by sun exposure, pollution, smoking and harsh environmental conditions. A powerful 15% concentration of L-Ascorbic acid works below the skin to simultaneously protect against premature ageing caused by UVA/UVB rays, whilst stimulating new collagen production. Regular use regenerates collagen and lightens sun-induced pigmentation leaving a more youthful appearance. Dramatically improves skin clarity. With Australian Native Plant Extracts. A potent 15% Stable Vitamin C Serum scientifically formulated to effectively deliver high concentrations of stable Vitamin C to your skin. Formulated to combat visible signs of premature ageing using a unique combination of Vitamin C (L-Ascorbic, Kakadu Plum), AHA’s (Milk Extract) & BHA’s that work both above and below the surface of the skin. A powerful 15% concentration of L-Ascorbic acid works below the skin to simultaneously protect against premature ageing caused by UVA/UVB rays, whilst stimulating new collagen production. The AHA’s & BHA’s work on the surface of the skin by exfoliating dead skin cells and hydrating the new skin beneath. With Australian Native Plant Extracts. A beautifully smooth cream that instantly provides an intense moisture surge to the skin. An exclusive blend of Vitamin C and, active firming ingredients that restores vital moisture levels in the skin while actively working on reducing fine lines and imperfections. It repairs skin suffering free radical damage from environmental conditions and provides powerful antioxidant protection. With Australian Native Plant Extracts. This superior Eye Gel formulation provides an intense Three Step Repair System to firm, lighten and smooth the skin surrounding the delicate eye area. Containing powerful ingredients of Eyeliss TM and Haloxyl TM, this Intensive Eye Complex is known to reduce under eye bags and lighten under eye circles with regular use. We also have a range of Vitamin C serums with Fluer De Mer Cosmeceuticals. Click here to view the range. Using these products are at your personal responsibility. The benefits of the Pelactiv Vitamin C skincare can have a superior outcome when combined with the support of Vitamin C orally – whether specifically in your diet or by form of tablet/powder. Supports immunity, oxygenates and strengthens cells, improves absorption of iron. Not produced by the body, Vitamin C is an essential vitamin. When using cosmeceutical strength skin care products always incorporate using a full spectrum SPF50+ for maximum protection from harmful UVA/UVB rays. Ltd. Manufactured and packaged in Australia. NOT TESTED ON ANIMALS.